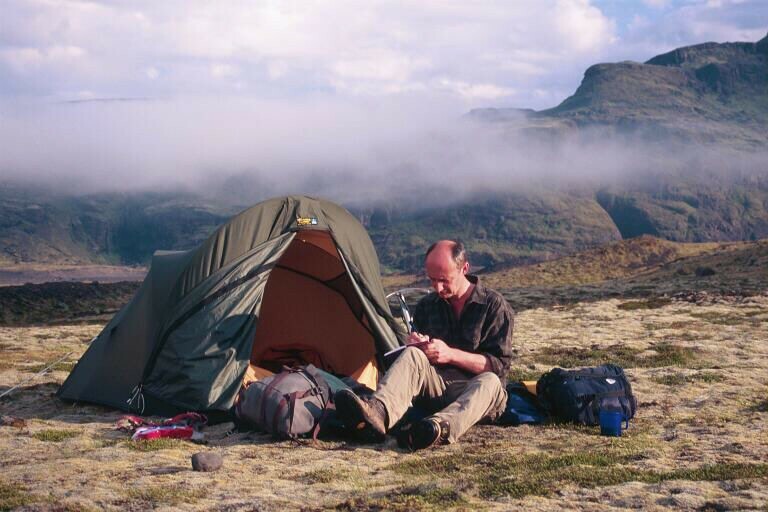 This is me writing up my diary or field notes outside my tent near Solheimajokull, Iceland, in 2003. I was in the field with Richard Waller, Zoe Robinson, Simon Cook and Will Adam for a couple of weeks, working at glaciers between Solheimajokull and Breidamerkurjokull. Thanks to Zoe for this photo. I can't remember it being taken (clearly engrossed in my work, as you can see (hem hem! )), but it looks as if we're in the middle of setting up or breaking camp as there seems to be a still-stuffed stuff-sac lying around. I like this photo because it was taken at one of my favourite field sites and it shows a lot of my old faithful field gear: the ruck-sack dates back to Ecuador trip, the red-strapped crampons (front left) and the ice-axe (stuck in the ground behind me) are the old originals from 1984. There's a big blue mug, as always, and I'm sure the tea-spoon isn't far away... I think those are even tins of mackerel I can see in front of the crampons. Mmmm... mackerel.